Did you know that October is the first official Non-GMO Month? This month, retail stores nationwide will celebrate the consumer's right to be informed of foods and products that contain genetically modified organisms (GMOs). What exactly are GMOs again? GMOs, or Genetically Modified Organisms, are products of biotechnology (also called genetic engineering, or GE), which creates new combinations of plant, animal, bacteria and viral genes by combining DNA from one species with DNA from another. The result: new organisms that do not occur in nature. GMOs are often not labeled as such. In many developed nations, GMO products are heavily restricted or banned altogether because they have yet to be proven safe for people's health and the health of the environment. However, in the U.S. there is a dearth of public awareness of the potentially harmful repercussions of GMO products. Here are four more reasons why you should celebrate Non-GMO Month this October and empower yourself to make the right decisions for you and your family. Currently, seed companies prohibit independent research with their products, leaving very little empirical data available. Genetically engineered crops can cause a variety of destructive problems on the surrounding environment. Farmers who use GMO crops can spray their fields to kill everything growing in the area except the specific GMO food crop. The increased use of pesticides and herbicides often leads to superweeds, which then become resistant to the same pesticides, creating the need for stronger, more toxic pesticides (that can leach into our food and water sources!). Some people question whether genetically altered crops and species threaten and violate the natural order of an environment. Also, genetic modification may involve the creation of foods that are prohibited by certain groups (e.g., the use of animal genes may conflict with some religions, as well as the diets of vegetarians and vegans). Whether you decide to limit or restrict your consumption of GMO products, the right to know what is in our food is important. Research has shown that many Americans would choose not to have GMO products if aware and given the choice. When shopping for food, it's a valuable practice to stop and ask yourself the basic question: Where does it all come from? It's time for us to be food detectives. 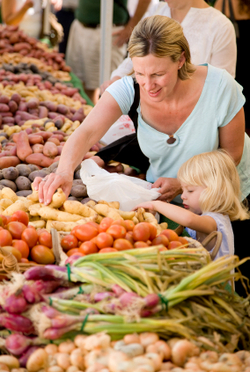 Buy produce and other food items from farmers' markets. Start conversations with the people selling your food to get more information. Grow your own food in a garden at home or join a community garden. Join a corporate garden or co-op to know where items are coming from. To help you choose the right foods, check out the Non-GMO Project's iPhone App Shopping Guide and the Non-GMO Shopping Guide. How will you celebrate Non-GMO month? To read the full article by Integrative Nutrition Founder Joshua Rosenthal go to The Huffington Post. Hire Yourself for the New Year!